You can get a fabulous homemade meal on the table even if your day is incredibly busy, and this quick fish au gratin is a perfect example. 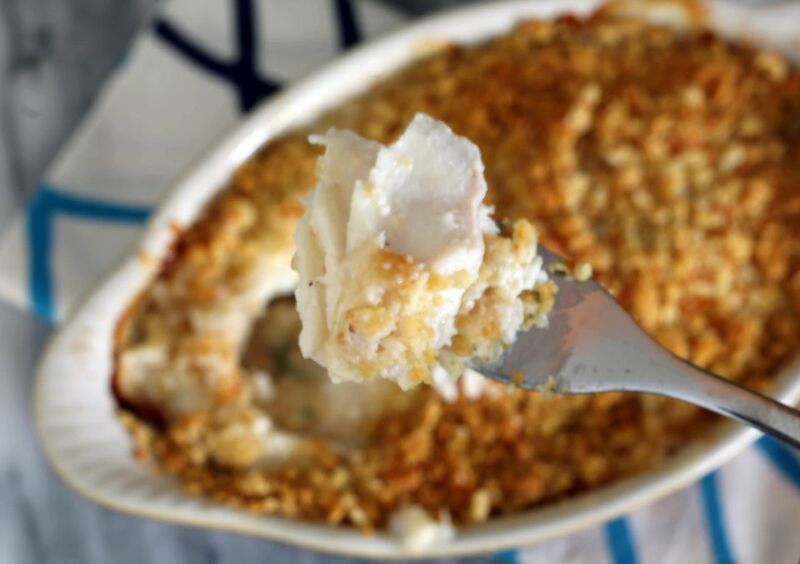 The mild white fish fillets bake to perfection in a simple sauce with cheese and a buttery breadcrumb topping. Just add a tossed salad or steamed veggies, and you have a delicious meal in no time. Some good choices for fish are haddock, cod, pollock, and catfish. If the fish fillets are thick, allow a bit more baking time; the fish should flake easily and be opaque. It should register 145 F on an instant-read thermometer inserted into the center of the thickest fish fillet. If you would like more color and extra flavor in the dish, add about 1/2 to 1 cup of cooked frozen peas or broccoli to the sauce. Or add about 4 ounces of sautéed sliced mushrooms. Chives or chopped parsley are both excellent choices for herbs. Butter a shallow baking dish large enough to hold the fish fillets in a single layer. Arrange the fish fillets in the prepared baking dish. In a small saucepan over medium-low heat, combine the soup with the milk and cook until hot and just simmering, stirring frequently. Pour the hot soup mixture over the fish. Sprinkle the shredded cheese over the fish. Combine the breadcrumbs with the melted butter and toss until they are thoroughly coated. Sprinkle the breadcrumbs over the casserole. Bake for 15 to 20 minutes, or until the crumbs are golden brown and the fish is flaky and thoroughly cooked. The cooking time depends on the thickness of the fillets. If you are using frozen fish fillets and didn't have time to defrost them in the refrigerator overnight, you can thaw them quickly in water. Just seal the fish fillets in a plastic food storage bag and immerse the bag in a large bowl or pan of cold water. If you use the microwave to defrost the fish, do it just before you plan to bake it. Make a homemade sauce if you like to avoid condensed soup. Saute 1/4 cup of finely chopped celery or mushrooms or a few tablespoons of shallots in 3 tablespoons of butter. When the vegetables are soft, add 3 tablespoons of flour and cook for about 2 minutes while stirring constantly. Gradually whisk in 1 1/2 cups of milk and continue cooking until the sauce has thickened. Use the homemade sauce to replace the soup and 1/4 cup of milk in the recipe.